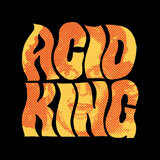 From their humble origins way back in 1993 in San Francisco, Acid King have, over the course of three albums and numerous splits and EPs, grown into one of the lumbering leading lights of the stoner doom scene, not just in the States but worldwide. This collection which brings together their self titled 1994 10″ EP and their 1995 debut album, “Zoroaster” gives us the chance to revisit those early days and see how the band has developed with the passage of time. This isn’t the first time this package has seen the light of day, in 2006 Japanese label Leaf Hound Records issued a version of this album but since that, the label appear to have committed hara-kiri so it now falls to Acid King’s current label Small Stone to finish the job…and finish it they will, this is limited to 1000 copies so when it’s gone, it’s gone!!! Listening back to these early recordings it’s incredible to hear how, barely a year into their existence, powerful, confident and fully formed the band sounded. Having Billy Anderson at the controls certainly helps to get the depth of sound, but musically Acid King had it all right from the start. For vocalist/guitarist Lori, the simplicity of the riff is key. I couldn’t really say this is fat free as the whole thing is bigger than Oprah Winfrey on a cake binge, but the uncomplicated arrangements and crushing, rolling riffs have more gravitas and weight than any number of widdly twiddly guitar work outs. Peter Lucas’ bass is so all encompassing it threatens to burst through the speakers and the band tune so low it almost drops off the scale of human audible tolerance, while Joey Osbourne’s drums take more of a beating than a child molester in prison!!! Lori caps the whole thing off with a vicious, sadistic snarl that still somehow retains her femininity. When she gives Old Nick a ticking off on “Evil Satan” you can almost imagine the horned one’s balls shrivelling!!! Nowadays bands peddling such sub sonic abuse are ten a penny but in 1993 Acid King adopted the scuzzy biker doom of St Vitus and mixed it up with the low end aural thuggery of the Melvins to create something pretty unique and terrifying. Perhaps Lori’s marriage at the time to Dale Crover of The Melvins caused her some irreparable musical damage. This is dark, heavy and oppressive stuff but not without groove, a bluesy heart and a psychedelic soul…imagine one of the hippos from Disney’s Fantasia sitting on your chest while Billy Holliday sings Black Sabbath tunes in the background while gargling razors!!!! If they were this good this early on, I’ll definitely be revisiting the rest of their back catalogue, I suggest you do too.